Abitare Omotesando house B has been booked and is not longer available. We thank you for the interest in our properties. Updates on this property status will be posted on the company website. Abitare Tamagawa Denenchofu Rm.202 has been booked and is not longer available. We thank you for the interest in our properties. Updates on this property status will be posted on the company website. 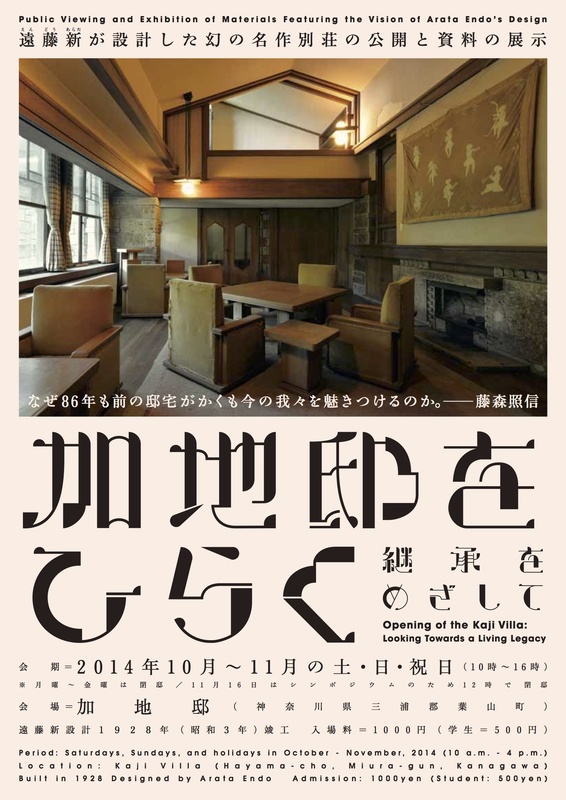 House B of the Denenchofu Terrace House has been booked and is not longer available. We thank you for the interest in our properties. Updates on this property status will be posted on the company website. Denenchofu Terrace House A&B in Denenchofu, Tokyo. 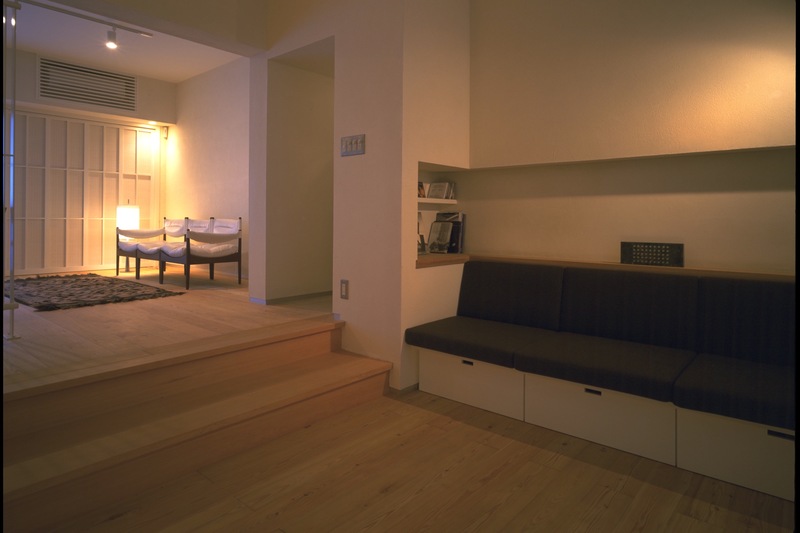 House B of the Denenchofu Terrace House is available for rent from September. Detailed information, floorplan and photos in the PDF leaflet (English). Photos and plans available here. 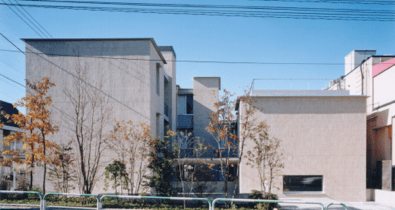 Flat 202 of the Abitare Tamagawa Denenchofu building is available for rent. Detail information, floorplan and photos in the PDF leaflet (english). All buildings are designed based on a set of assumptions covering a myriad different aspects ranging from cultural, social and technical topics. All architects know, that once a building is finished, all those assumptions and decisions taken during the design phase are put to the final test. After completion most of the variables of a building’s life cycle are outside architects control, however environmental factors that affect the building can be monitored, providing with valuable feedback for future projects. Factors such as internal temperature, CO2 levels, humidity and others can be logged thus providing confirmation of the performance of a specific building assembly. Although many weather data monitoring systems are available, there are not many one stop solutions that can be checked remotely and unobtrusively at a reasonable price. However we found one cost effective solution to gather building data by using a plug-in computer coupled with an environmental monitor card. Raspberry Pi type B computer board with case, after initial set up. The computer in question is a Raspberry-Pi (RPI). It was originally conceived for educational purposes an has an open architecture that allows for the addition of modules with different functions. As an educational project, the Raspberry Pi has a wide following worldwide and there are already many applications developed by students, hobbyist and the like. For us, one very interesting add-on module (and the reason we chose to try the RPI) is the AirPi weather station. This small card sits on top of the RPI computer and through its sensors logs data on temperature, humidity, co2 and gas. All the collected data then can be automatically uploaded to the web and other applications. 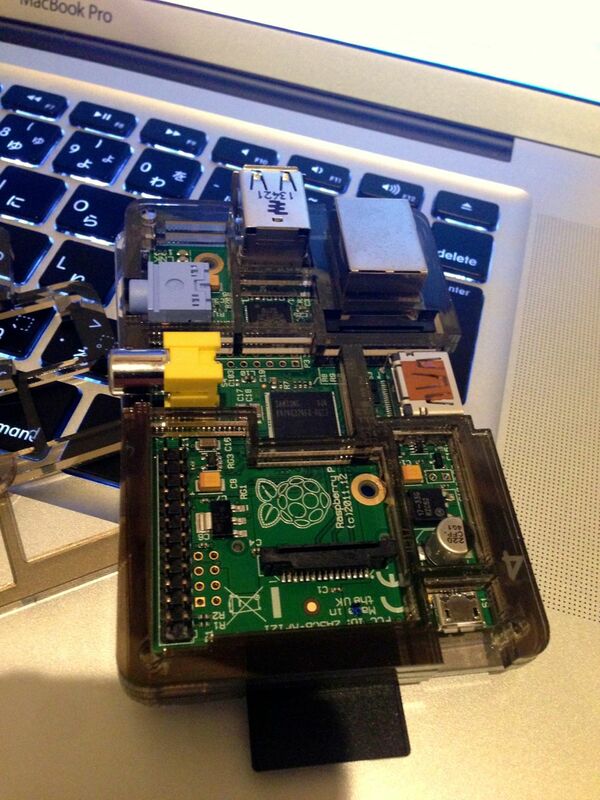 Attracted by its (apparently) ease of use and implementation, we ordered both an RPI and an AirPi module. The RPI has already been tested few days ago and proved very easy to set up, now we are eagerly waiting the arrival of the AirPi card so we can run tests on some of our completed projects. (Hopefully the results will be good). Finally, it is good to note that the AirPi was developed by team of students in the UK, check their video explaining the AirPi! Photography is an important tool for any architectural practice. It is used during all the stages of the development of a project, also very often architectural images are the last remaining record of a building after its demolition. Not always there is enough time and budget to take proper (professional) pictures of all projects and we might end having hundreds of casual pictures taken with mobile phones or point and shoot cameras. Also the expense of buying shift lens might not be justifiable in small projects. Typically, using any photo editor these images might be acceptable for web publishing, however not all photo editors offer a good solution for fixing lens distortion. One useful tool we found to fix lens distortion is the software PT lens. This software can be used as a plugin tool for many brand photo editors (Aperture, Photoshop, etc.) and also has a standalone version which has a very small memory footprint and is easy to use. The package has lens calibration profiles for main SLR camera lens and can even fix mobile phone pics like the one posted here. Tokyo Marine HQ (1974) . Original pic on the right. Edited with PT lens on the left. 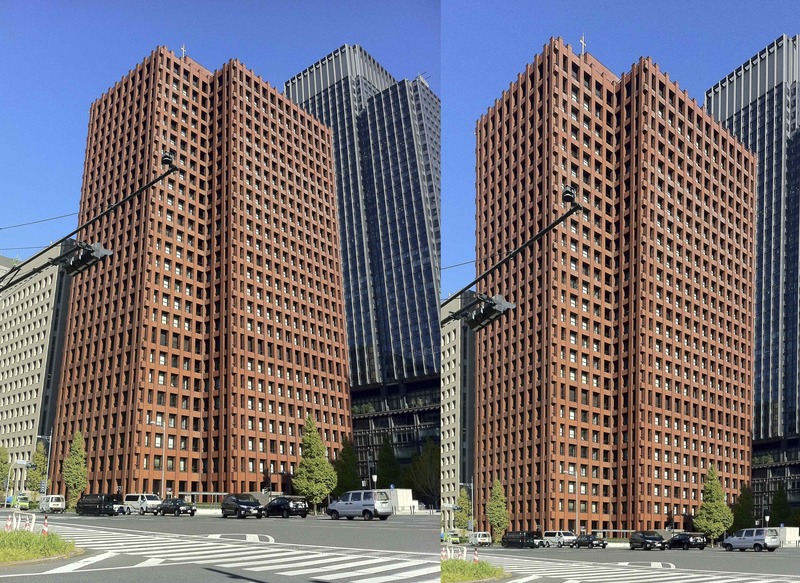 The building in the image is the Tokyo Marine Insurance HQ by Maekawa Associates (1974) and the pics were taken with an Iphone 4 camera. Good weather helped to take a nice perspective of the building, however the camera lens distortion was too strong. Using PT lens the image was adjusted easily. Now we just have to fix hundreds of images that might benefit of such a treatment. Link to the PT lens page here. During the weekend of the 10th-11th of May 2014 the closing event of the Hayama Art Fest 2014 was held on the grounds of the Moriyama shrine in Hayama, Kanagawa prefecture. Like previous years, the event had a good attendance, due in part to the excellent weather during the weekend. 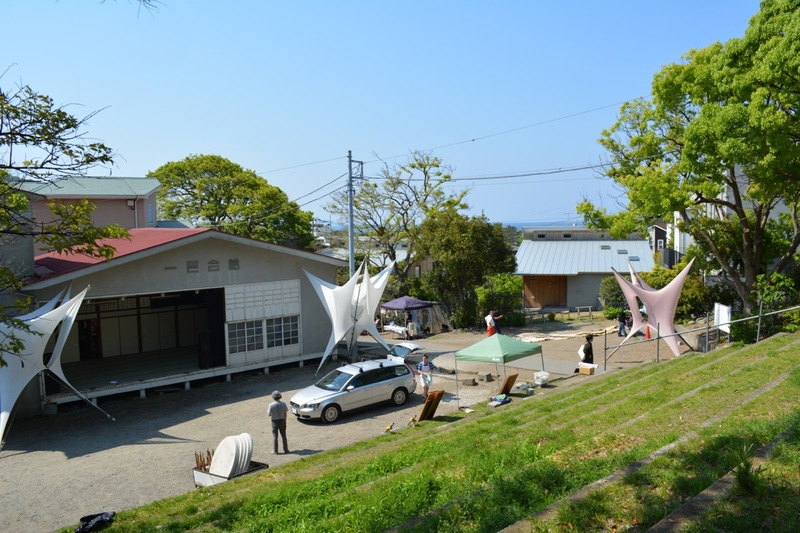 Preparations for the Hayama Art Fest with the Hayama Compound to the right. 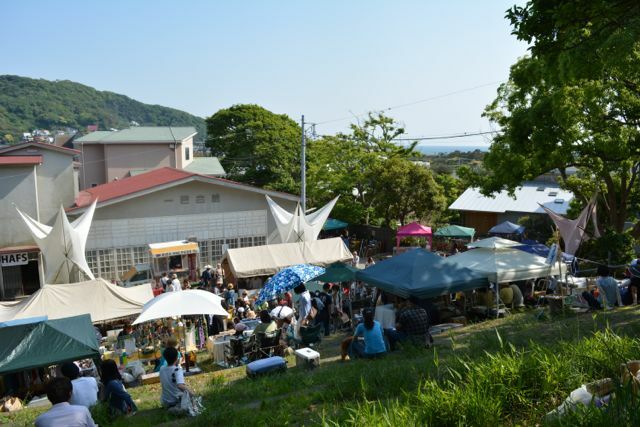 Hayama Art Fest 2014-At the right the entrance level of the Hayama compound. 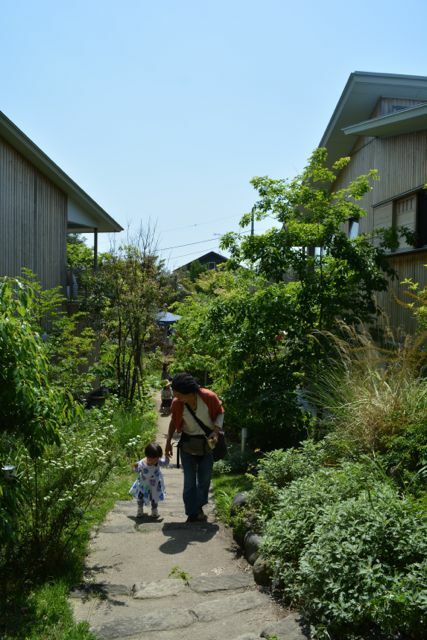 This year the grounds of the festival were extended towards the interior of the Hayama Compound plot, allowing people to walk from the Moriyama shrine grounds through the Hayama compound public space and towards the beach. 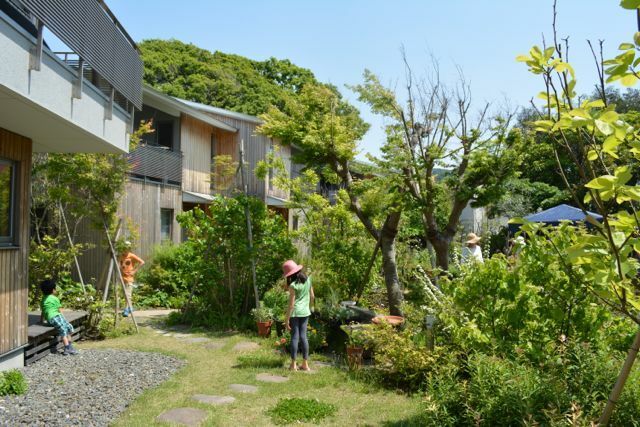 Although the compound public space is intended to be used by the residents, it also can be connected at will with the pedestrian path that goes to the shrine, thus serving as a shortcut for people that want to go to the beach front from the shrine. Pedestrians used the stone stair and path to go down to the street level, crossing through the compound garden, just as intended in the original project concept. 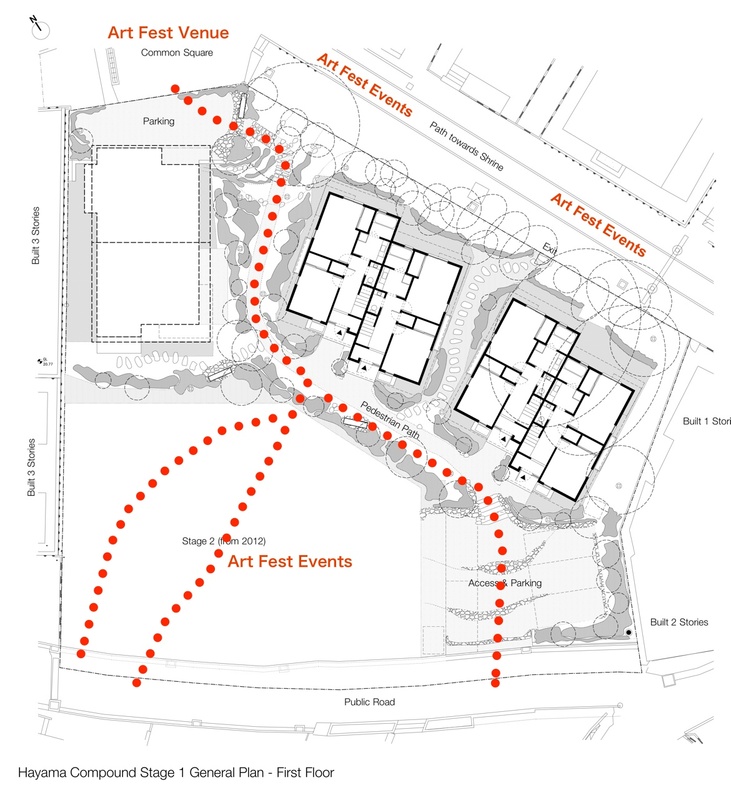 This temporary integration between a semi public green space and the street level infused the project with a surge of activity that served as a test for the development of the compound in the future.